Back in May, Google started to split off functionality from its Drive app, releasing standalone Docs and Sheets productivity apps for iOS as well as for Android. The search giant has now released a version of Slides, an app for creating and editing presentations, for Apple's mobile operating system. 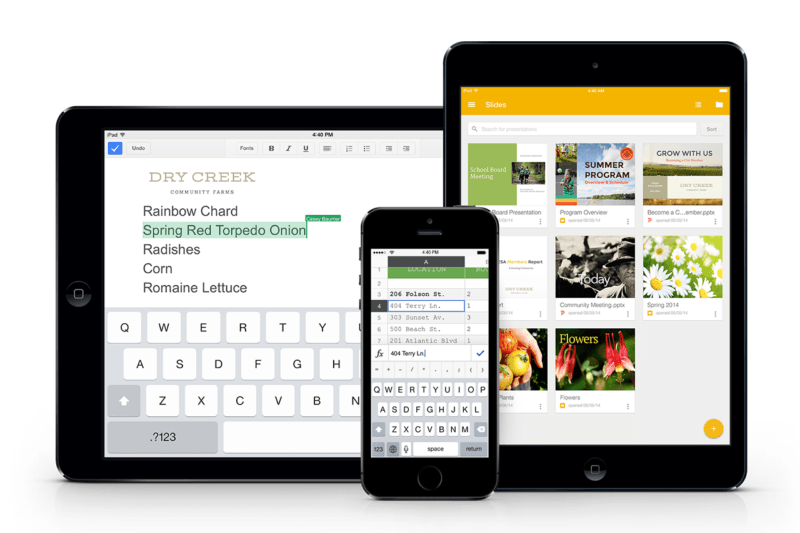 The iOS version of the app lets you to create, edit, and collaborate with others on presentations from your iPod, iPhone, or iPad, as well as open, edit and save Microsoft PowerPoint files. You can rearrange slides, format text and shapes, and more, just as you would using the web-based version of the software, and when you're done, you can run the slideshow directly from your device. The app auto-saves presentations, and can also be used in offline mode. Google is also updating Sheets and Docs with the ability to open, edit, and save Microsoft Excel and Microsoft Word documents. Sheets users can now also view charts, insert formulas, and use find and replace functionality. With the release of Slides for iOS, all three of the Google Drive productivity apps are now available across Android, iOS and desktop/web.